I have been searching for my European roots forever, it seems like. Since I was a kid, the connection to the Europeans was very vague and I always felt like I didn't really know who I was and where my family comes from. After searching through Ancestry.com for years and trying to ask family members what they could remember, I used 23andme.com. 23 and Me is a website to test your DNA which gives you ancestry information and used to give you health information. I got my results one day, and I jumped on the map view to see if I had family in any of the places where my ancestry is supposedly from. There was one distant cousin in Norway! He was supposed to be a 3rd - 5th cousin. I decided to message him to find out if I could find a link. I didn't hear anything back from three months, but I had my trip planned anyway. I planned to end my European vacation in Norway and stop by Drobak to take it all in - with no clear direction or idea where to go. 2 weeks before I left for Europe, I got an email back from the cousin. He was willing to help and was more than helpful through the process. He is an amateur genealogist that was able to translate all the Norwegian documents that lead me from my roadblock of only great grandparents names, to people from the 1600s. He also got me in touch with a living relative in Drobak! He hit a roadblock when going through the path of my great grandmother's brother's side. He found a grave, and called the graveyard to see whole bought the grave. That led him to my 2nd cousin who is still alive. We contacted each other and I excitedly flew to Oslo a couple weeks later. Eddy, my 2nd cousin, was absolutely amazing to us. He picked us up from the airport and drove us to Drobak with the 3-5th cousin. 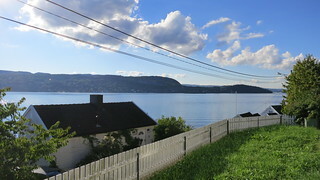 The four of us took a drive through the scenic and beautiful seaside town of Drobak, 20 minutes south of Oslo. We saw the grave sight (minus the missing graves) of my great grandparents. We then went to the original house that my great, great, great grandpa Olaf built. We were able to walk into the house and see the same view that my ancestors have seen for 150 years.